Some of you out there are lucky enough that you are safely ensconced in the center of a State and you never have to deal with the Interstate Agreement on Detainers. Unfortunately, we around here are not so lucky. With three other States in shouting distance, it's not too surprising when someone gets caught in the other State first and we have to wait our turn. A detainer goes out to whichever prison that State has lodged the person in and then the games begin. Every single prisoner out there seems to know the magic number 180. They hear from the guy in the cell next door, or a helpful counselor, or Uncle Bob (the family legal expert who's been to prison three times) that if they just notify Virginia that they want their trial then Virginia must come get them and try the case within 180 days or it goes away forever. They may get a lot of details about how everything works garbled, but they always remember that 180 days - and they constantly tell their attorney about it once they are shipped to Virginia. So, what are the actual rules? Is the 180 day limit a rock solid, irrefutable speedy trial rule?? Of course not. Nothing's ever that simple in the law. § 53.1-210 is the statute in Virginia which contains the Agreement on Detainers. In Kentucky it's 440.450. In Tennessee it's 40-31-101. In West Virginia it's §62-14-1. In North Carolina it's § 15A-761. In Maryland it's § 8-405 (and the statutes around it). That should cover most of the ones an attorney from Virginia should need. If you need the version from Wyoming or Alaska you are on your own. There are two events which actuate this interstate compact. First, Virginia must have lodged a detainer against someone serving a sentence in another State. The warden of the institution where the defendant is being held is required to notify the defendant that a detainer has been lodged against him. Second, the person must "cause" both the prosecutor and the court in the jurisdiction which issued the detainer to get a letter stating he wants to exercise his rights under the compact. The mistake a lot of prisoners seem to make at this point is to send a letter themselves directly to the prosecutor and/or the trial court. Often, they even fail to send both letters. However, that error is not the primary reason that their effort fails. It usually fails because of continuances once they are in Virgnia. Under Article IV, the prisoner must write a letter, informing its recipients of her place of imprisonment and requesting a final disposition of the charges involved in the detainer. She then has to give it to the warden, who will then send it to the courts and prosecutors in all the jurisdictions from that particular State which have issued detainers. The warden also has to send a certificate stating the term of commitment under which the prisoner is being held, the time already served, the time remaining to be served on the sentence, the amount of good time earned, the time of parole eligibility of the prisoner, and any decisions of the state parole agency relating to the prisoner. Once all this arrives at the office of the prosecutor and the court the prisoner has caused it to be delivered. Causing the letter to be delivered operates as a waiver of the prisoner's extradition rights and as an agreement that the prisoner will agree to serve any time given by the Virginia after she finishes serving her time in the original sentencing State. Virginia also has the option to ask the original State for temporary custody of the prisoner. If this is done there is a delay of 30 days within which the governor of the original State may deny Virginia temporary custody either on the governor's own motion or the motion of the prisoner herself. Art IV. After that, the prisoner is shipped to Virginia to face trial in the Commonwealth. There are two timelines within which the prisoner must be tried. The first is the 180 day timeline. This timeline starts from the moment the court and prosecutor receive the letter stating the defendant wants to be brought to Virginia for trial. The second timeline is 120 days.1 This timeline starts from the day the prisoner is brought to Virginia by request of the Commonwealth without the prisoner so requesting. Both of these timelines can be extended by continuances not objected to by the defendant. However, if either timeline is reached the charges must be dismissed with prejudice. Art. V(c). The defendant has an affirmative duty to prove the court and prosecutor received the letters and appropriate certificates from the warden of the prisoner's original State more than 180 days prior. See Eckard v. Commonwealth, 20 Va. App. 619 (1995). If the sending State did not send the appropriate certifications with the letter the 180 limit is not held against Virginia. Id. There's also an anti-shuttling provision in the compact. If a defendant is delivered to Virginia to face trial all of the charges which led to the detainer must be dealt with before the prisoner is shipped back to the original State. If they are not they are dismissed with prejudice. Art. III(d) and Art. IV(e). There's one major limitation to this compact. It only applies to indictments, informations, and complaints. For this compact to apply the case must be procedurally ready for trial upon the charging instrument linked to the detainer. If there are procedures which are required other than trial - preliminary hearing, grand jury - then the Interstate Agreement on Detainers does not apply. In other words, if the detainer is based on a warrant neither the timelines nor the anti-shuttling provisions apply. See Locklear v. Commonwealth, 7 Va. App. 659 (1989), and Smith v. Commonwealth (U), DEC10, VaApp No. 2170-09-2. Additionally, this compact does not apply to probation violations. Commonwealth v. Brown, 85 Va. Cir. 159 (2012); See Also Bolden v. Murray, 841 F. Supp. 742 (1975)(applying the same rule to the parole system probation supplanted). And it does not apply to a capias. Chu v. Commonwealth, 61 Va. Cir. 338 (2003)(court refers to capias as "bench warrant"). In other words, if a detainer is issued on a warrant, capias, or probation violation the prisoner can file all the letters he wants, but the compact does not apply and he cannot be shifted from the other State to Virginia under the Agreement. If he is shipped to Virginia anyway it is an extradition outside the compact and none of its protections apply. Instead the Commonwealth would be subject to the regular speedy trial constraints and nothing further. This leads to an interesting question. If the prisoner is in a jail in Virginia, but not under the terms of the compact, what authority allows the prisoner to be shipped back to the originating jurisdiction? 1 The 180 day limit is under Article III and the 120 day limit is under Article IV. Although Article IV read initially to me like the way Virginia is supposed to get the prisoner from the State currently holding him, Article V speaks of bringing someone to Virginia under either III or IV and case law indicates that III is from a prisoner's request while IV is from Virginia's request. See Yiaadey v. Commonwealth, 29 Va. App. 534 (1999). I must admit, before I became a prosecutor I had never heard of citizens hiring private prosecutors. I don't know if it was happening in any of the jurisdictions wherein I practiced as a defense attorney (I never saw it), but it is something our office bumps into every so often. It seems to be something that citizens want to do with misdemeanors more than felonies and I suspect this is the result of two factors: (1) the fact that citizens can file a misdemeanor complaint to the magistrate themselves and therefore are more vested in any warrant which is issued, and (2) the fact that hiring a private attorney to prosecute any kind of serious felony case would be prohibitively expensive. In any event, until recently I had a bone deep belief that private prosecutors were not allowed for by the Virginia State Code and therefore a citizen could not hire her own. However, it seems I was semi-wrong. Cantrell v. Commonwealth, 229 Va. 387 (1985): (1) Whether a private prosecutor can appear is at the trial court's discretion. (2) A private prosecutor “is absolutely prohibited from (a) taking any position, (b) making any argument, (c) offering any evidence, or (d) advocating any cause which would be forbidden to a public prosecutor.” (3) A private prosecutor cannot (a) initiate a prosecution or (b) appear before a grand jury. (4) The private prosecutor can take part in the case only with the approval of both (a) the trial judge, and (b) the Commonwealth Attorney. (5) The private prosecutor cannot make the closing argument without the approval of the trial court. (6) The private prosecutor cannot (a) take part in a decision to engage in plea bargaining, (b) deciding the terms of a plea bargain, or (c) a decision (i) to accept a plea of guilty to a lesser crime or (ii) to enter a nolle prosequi. (7) The Commonwealth Attorney must remain in control of the case, although there is no specific limit as to how much work the private prosecutor can do. (8) A private prosecutor representing someone with a civil interest in the same circumstance (a) violates Due Process under the Virginia Constitution and (b) requires no showing of prejudice on the defendant's part for reversal of a conviction. There are also several cases which address a bit of the issue. The oldest I found is Compton v. Commonwealth, 163 Va. 999 (1934), in which the Virginia Supreme Court overturned a conviction because the Clerk of Court and High Sheriff, as private citizens, hired a private prosecutor and therefore tainted the case. A few years later, in Commonwealth v. Duling, 79 Va. Cir. 764 (1934), a Virginia Circuit Court laid out the rule that the only way a private prosecutor can participate is with the Commonwealth Attorney's agreement. Of course, this is a non-binding opinion, but it is well reasoned, persuasive, and its position was adopted in Cantrell. In more modern times, in Adkins v. Commonwealth, 26 Va. App. 14 (1997), the Court of Appeals overturned a conviction because an attorney who has been previously hired as a private prosecutor cannot subsequently be appointed as the special (governmental) prosecutor when the Commonwealth Attorney develops a conflict – even if the attorney stops taking money from his clients once appointed special prosecutor. Finally, in Riner v. Commonwealth, 268 Va. 296 (2004), the Virginia Supreme Court held that it was within the trial court's discretion as to whether a conflict existed which would disqualify the private prosecutor (the trial court decided that the private prosecutor did not represent a civil interest against the defendant which would automatically disqualify the private prosecutor). So, basically, if doubly approved by the judge and the public prosecutor, the hired gun prosecutor can take part in the case as long as he is under the control of the Commonwealth Attorney and has no civil case conflict. In particular, I think the civil case conflict rule is important, although it doesn't entirely eliminate the private prosecutor's monetary inducement to seek a conviction. After all, the party paying for the private prosecutor is paying him to be biased. However, the opinions seem to say that this was okay in Jolly Olde England, so it's okay in Virginia until the General Assembly says it ain't. The only rule above that I don't think makes much sense is the prohibition against the private attorney making the closing argument unless the trial court approves – effectively creating a presumption that the public prosecutor should do the closing argument. Since the private prosecutor is forbidden from arguing anything which a public prosecutor could not, I don't understand why there is an extra protection added to this specific aspect of the trial. It would make more sense if the public prosecutor was required to make to both the opening statement and closing argument, as a demonstration that he was in control of the case. In fact, since the public prosecutor must stay in control of the case it would make much more sense if the presumption was that the public prosecutor is required to make the opening statement and thus demonstrate his control by laying out the evidence that will be presented. I suspect this is just one of those stray rulings that just keeps getting quoted and relied upon over and over again without any thought put into it. As anyone who has read this blawg for longer than two weeks knows, I am not one of those that thinks the application of the jurors' prejudices to a case is the universal panacea that others believe. Who Pays the Piper? The Complaining Witness? § 19.2-229. When complaining witness required to give security for costs. For good cause the court may require a complaining witness to give security for the costs and if he fails to do so dismiss the prosecution at his costs. I tripped across this statute years back and I've always wondered how it was meant to be applied. I looked on Lexis and did not find any annotations and I've never seen a court apply this, so my curiosity was never really satisfied. Today, while I was researching something else, I finally ran across something that helps explain the statute. Pifer v. Commonwealth, 14 Gratt. 710 (1858) is a Virginia Supreme Court case which has a monograph attached to it explaining who should have to pay what costs. It lays out several cases which put the costs squarely at the feet of the complaining witness if the complaining witness took the charges out herself rather than being required to testify. A volunteer informer ought to be made a prosecutor, and liable for costs in case of failure; but one who is compelled to be an informer, cannot be considered a prosecutor. Wortham v. Com., 5 Rand. 669; Com. v. Dove, 2 Va. Cas. 29. And on a trial for a misdemeanor, if the jury find for the defendant, the voluntary informer is liable for the costs, and after verdict the prosecutor cannot show by parol evidence that he was called on by the grand jury, and did not voluntarily give the information. Com. v. Dove, 2 Va. Cas. 29. [T]he prosecutor's insolvency or inability to pay costs is, ordinarily, good cause for ruling him to find security for such payment; but if, in the opinion of the court, public justice requires that the prosecution should proceed, it may refuse to dismiss the indictment, though the prosecutor be insolvent, and security for costs be not given. Com. v. Hill, 9 Leigh 601. On an indictment for an assault and battery on the voluntary information of the person assaulted, the informer and prosecutor, being the only witness for the prosecution, is a competent witness, though liable for costs in case defendant is acquitted. Gilliam v. Commonwealth, 4 Leigh 688. Part 6, supra, is still in the Virginia Code as § 19.2-331 and I think the vast majority of cases in which this applies - and applied - are misdemeanors. There is no reason to think this case law does not apply to the current statute. Why is this important? Because in Virginia everyone can go and fill out their own complaint and present it to a magistrate, without the participation of a Commonwealth Attorney or police officer. I assume, without having done the research, that some similar process existed back in the 1800's. When a citizen goes to the magistrate on her own, presenting a complaint and asking for a warrant, that citizen is a "volunteer informer." As well, presenting a complaint also makes her the very epitome of a "complaining witness." Furthermore, in the absence of a prosecuting attorney, § 19.2-265.5 seems to make it clear that the complaining witness fills that slot. I can't find anything in the modern statutes which relieves a volunteer informer / complaining witness of her duty to pay for the prosecution if she loses her case. If she went voluntarily to the entity (magistrate or grand jury) which issued the warrant or indictment, she is on the hook. 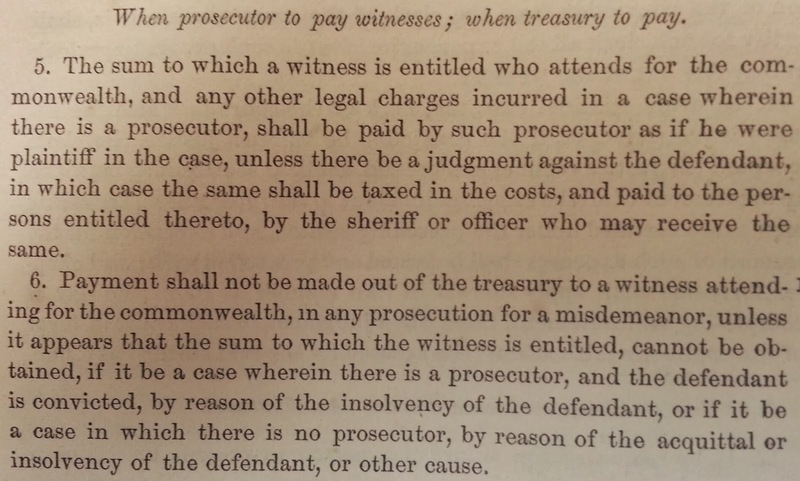 All § 19.2-229 does is allow the judge to require the complaining witness to put the money up ahead of time and if that witness either cannot or refuses to do so dismiss the case and bill the complaining witness for the costs. In my personal opinion, the "good cause shown" part of the statute limits the class of those whom the judge can apply this statute against. Good cause would probably be the fact that someone is a frequent abuser of the system, filing charges often and then dropping them. This could the person who - at least thrice a year - gets in drunk fights, runs to the magistrate to charge everybody the next day, and then wants to drop it when it goes to court a month later. This could be the merchant who swears out bad check warrants, knowing full well that his employee turnover rate is so great there is no way he can prove 75% of them. Most helpfully, it could be used on counter warrants. These happen when someone charged with an offense herself runs to the magistrate and takes out warrants against those who are witnesses against her in order to muddy the waters. Still, the amount of proactivity required in order to do this would be prohibitive in almost all cases. Someone would have to search through all the charging papers and cull those which fell afoul of the standards set. On top of that, the judge almost never sees the complaining witness until they show up for trial and therefore could only take the allowed statutory action in the seconds before the trial was set to commence. The only possible working framework I can see for this is if the judge issued a writ of mandamus, requiring a particularly troublesome abuser of the system from coming to court unless she had fulfilled the conditions of § 19.2-229.